"You are so lucky!" We have all heard and said these words, but what do they imply? That someone's life is easier than yours? That their good fortune was brought on by magic, while you, poor unfortunate soul, have been cursed with bad luck? That doesn't seem like a realistic, fair way to look at other people's lives. I am making an effort stop saying it to others. Especially to other mothers. I have gotten to a point-- why did it take me so long?-- when faced with someone who seems to 'have it all' that I can take a step back and think: We all have our struggles. We all have our challenges. And here's the big aha! for me-- someone will always have it easier than us, and-- more importantly-- someone will always have it harder. I have given a lot of thought to why it makes me so uncomfortable and why it is such a turn-off when someone tells me I'm "lucky." I think it is because attributing life to luck devalues our hard work and the challenges we have or are working to overcome in our lives. It seems a disservice to our fellow mothers to avoid acknowledging their blessings and their struggles by immediately assuming someone is "just lucky." These days, people have said it in the context of me being a stay-at-home-mom, or because of the fact that I-- gasp!-- use a babysitter from time to time. I was due for a dental check-up. I do not have a lunch break where I can squeeze in a cleaning. My husband and I had to plan and organize and discuss just when this dental visit would occur. A few weeks went by. I was finally able to coordinate a time when our busy college-age babysitter could watch the kids at the same time that there was an opening for me at the dentist office (no small feat). So anyway, I'm there, lying on a vinyl reclining dental chair with my mouth wide open while the dental hygienist asks me about kids, work, etc. I explain I'm a stay at home mom. She immediately informs me how lucky I am. She doesn't question how on earth I made it to a dentist appointment at 10 a.m. even though I had a 3 year old and a one year old at the time. It clearly didn't occur to her. Feeling defensive, I offered that I had to get a babysitter to come to my appointment. And I had to go home immediately after the appointment so my babysitter could go to class. My cell phone was on my lap the entire check-up because I worry about my kids every minute they are with a babysitter. Yet again, the dental hygienist only went on to express how lucky I am that I have a babysitter. Wait...what? She had just finished telling me that she works part-time while her own mother watches her children. Free childcare with your own mother? That sounds like a dream to many of us. Yet I'm "lucky" to find and pay a stranger to watch my kids so I can go to a freakin' dental appointment? I was speechless. Probably a good thing, considering there were various sharp metal instruments in my mouth. I offer this not as a condemnation of the dental hygienist. I am sure she is a nice, well-meaning person doing her best. I am using this as an example of how close-minded we can be when comparing our situations to those of other moms. It is so easy to think the grass is greener on the other side, that the SAHM's life is fun and luxurious, or that the working mom's life is full of alone time and freedom. But in doing so, we are not acknowledging the fact that everything has good and bad sides to it. For better or worse, we all want acknowledgment that we are working hard, don't we? I don't think anyone wants to seem like things just fell in their lap. Did I lecture that dental hygienist? Did I sit up and argue that Boo hoo, I have it so hard?! No. I just took a deep breath and let her think her thoughts. It is extremely hard to change people's minds anyway. I am sure there are some ways I do have it "easier" than she does. I'm sure there are some ways she has it easier than I do. Above all, I am trying to resist thinking she is the lucky one--- to live near her family-- which, yes, is my number one source of mom envy. 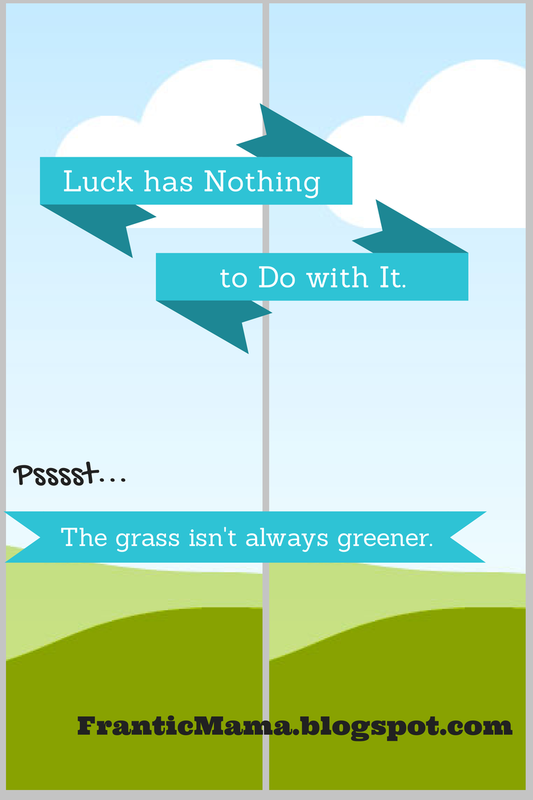 What are your thoughts on luck? Do people say it to you? Do you find yourself saying it to others? Why is it so tempting to think life is determined by luck or fate? Let's Connect On: Facebook, Twitter, Pinterest, Google+, & Instagram. What was your Hardest Parenting Transition?